2018: COUGAR ATTACK FATALITY ON MT. HOOD. On or about Sept. 7, 2018. 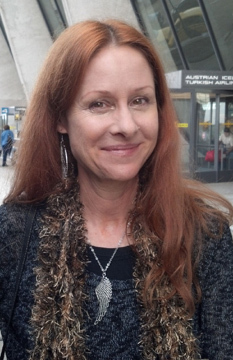 Diana Bober, an experienced 55 yr. old female hiker is alone and is killed by a cougar and her body found days later. Location: the Hunchback Mountain Trail. This mountain looks down at Welches and the Zig Zag Ranger Station. This author has hiked the trail years ago. It's very steep and densely-wooded. Diana Bober was from Gresham. See picture of her to the left. Also mentioned in the newspaper accounts was a 2013 killing by a cougar in a wildlife sanctuary near Sherwood, Oregon. A worker there was the victim. 2018: COUGAR ATTACK FATALITY IN PUGET SOUND. May 19, 2018. Location: east of Seattle in low elevation woods on the suburban/rural fringe near North Bend. Two adults on mountain bikes were attacked by a medium size cougar. They tried their best to do the suggested safety actions, but the 31 yr. old woman among them fled into the woods on foot after the cougar grabbed her 32 yr old male companion by the head. The 32 yr. old male was bitten severely on the head/face but survived after surgery. She, however, was killed by the cougar. August 2, 2018. Olympia's largest hospital, Providence St. Peter's, put out a public safety alert that a cougar had been spotted roaming its grounds near the Mother Joseph Care Center. The hospital owns several acres of swampy, forested land adjacent to its facilities. But still, this hospital is right in the heart of town. Dept. of Fish and Game were called, but it is not known if they found the cougar (they probably did not find the cougar). August 10, 2018: The Bend Bulletin newspaper in a front page story reported that a resident owning a home in a densely populated area on Awbrey Butte had witnessed a cougar attack a deer grazing on his lawn. The cougar ran away and was not found... Corey Heath, a spokesman for ODFW made statements. The newpaper said "In the past month, other close encounters with cougars were reported in Springfield, Oregon and Ashland, OR. Springfield police reported that a female cougar had to be shot and killed June 24th...One resident called the police to report the cougar was stalking children who were playing in a swimming pool." Newer Reports are from mid-2013-early 2014. One event occurred in August 2013 at the annual Oregon Star Party in the Ochoco Mountains of Central Oregon. Here, an adult cougar appeared to be following a group of hikers that included two younger children (I interviewed the hike leader just hours after the event). A second event occurred in June 2013 west of Olympia, WA, when an adult female jogger with a dog was being trailed by an adult cougar. She had a near-confrontation, then tried to move back to a main highway, but the cougar followed her. Only the intervention of a man in a pickup who gave her and her dog a ride ended this scenario (related to me by the jogger, in person). May 31, 2008, Southern Oregon, according to ODFW statistics, is probably the area of Oregon with highest cougar populations per capita. 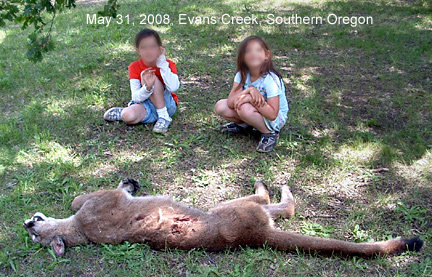 Jeff, the father of these two girls, wrote me on June 1st, 2008, saying, "Yesterday, I killed a cougar in my driveway. My wife and several neighbors were having a yard sale. My wife let my girls ride their bicycles home to get a sack lunch and come back....[name] is 8 and [name] is 6. I have always been told I am overprotective, but when I heard the girls went home, I hurried off to check on them. Before I got 100 feet out the gate, I saw [the six year old] running frantically saying there is a mountain lion chasing [the 8 year old]. I went as fast as I could, hoping I would find [name] saying it ran off into the bushes, but as I approached I found a ghost-white 8 year old little girl staring at a cougar not 15 feet away. She was on the right side of the driveway and the cougar was 2-3 feet off the left side between two trees. I was riding one of the girls' little quads, and I pulled in between her and the cougar, [but] it did not even seem concerned. I asked [name] to stay behind me, and I let her go back up the hill to where the people were at the yard sale and told her to send Mom back with a gun. I stayed there about 5-10 minutes and the cat never turned or looked away until my wife came in the car, then she ran down the bank and went into a burrow where the creek carved under a tree stump. When another neighbor came, we walked around and scared it out and killed the cat. I was mostly concerned with the fact that it didn't seem to be frightened of humans. I am not small (6' 1" 275 pounds) and the cat was maybe 50 lbs (young female), according to "Jim Collum," Oregon State Trooper, who came out and picked up the dead cat." --- Note: Evans Creek is on the suburban-rural fringe near Medford, Oregon. Other notes: I have polished up Jeff's grammar a bit for better readability, but otherwise the account is only altered to protect confidentiality. Jeff also sent me several other pictures of the incident.... Skip to section "How Much Real Danger to YOU". September 17, 2008, AN ATTACK: ANOTHER RECENT COUGAR INCIDENT, THIS ONE INVOLVING AN ACTUAL ATTACK.....this occurred on September 17, 2008 in a small town on the Columbia River in north-central Washington. This town is named "Grand Coulee," after the huge dam that it next to and where many of its residents work. An 11 year old boy and two other youths were playing in the 11 yr. old's backyard, running around and around, when a 100 lb.cougar (estimated weight) jumped out of some nearby brush and "scratched" the boy, "bowling" him over and leaving "two or three cuts on his scalp." The Tri-Cities Herald newspaper account is worded in a manner that seems to minimize what was undoubtably a terrifying event for the children, and one which now leaves a residue of fear and anxiety among the town's residents. It was noted that a permit to hunt for the cougar with dogs for up to 30 days was issued. A KING 5 television account mentioned that the boy also had suffered some bruising. Why the newspaper seemed so reticent to characterize the event as a cougar attack is a telling commentary on the ambivalences which exist in both the public and in the govenmental agencies regarding this potentially very dangerous predator. See also the July 20, 2008 event in Olympia, WA (click here). A Second Oregon Cougar Story "Mistaken Identity"
The lush greenery marked an area of small springs seeping across the jeep road. We were 3900 ft. high on the west side of Mt. Pechuck, just outside the boundary of the Table Rock Wilderness (only 28 air miles east of Oregon's capital city, Salem). My family of four had passed along this jeep road two hours before on our way up to the divide. Our group was composed of my wife, myself, the boy pictured, plus our baby riding in his Baby Jogger. Now, in mid-afternoon, we were headed back to our car. HEY, these tracks were NOT here on our way up! They were still oozing water! At the time, we were excited to witness such awsome tracks; the truth was, despite all my years of wilderness travel, I was relatively ignorant about the increasing prevalance of mountain lions in Oregon until I began to do some concerted research on the subject. 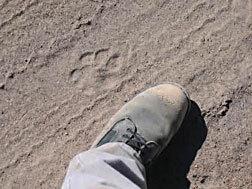 To better photograph the suspected tracks, we carefully filled them with crumbled-up Cheese-Its, and took this telling image--- the track books I consulted indicated that the tracks looked like those of a large cougar, probably an adult male. North American cougar statistics point out that if a cougar is going to attack a human, his favorite type of human prey is an elementary age child. In my research I found that of the documented human attacks in the US and Canada since 1890, over 2/3s of them have been aimed at this rather defenseless type of human (13 out of the 19 fatal attacks were initiated at children). Important Note about this picture: I am not a professional tracker, and I have had controversy over the identity of this track; eg. three very knowlegeable persons wrote to me over the course of the last year to say that the track was that of a black bear, saying that sometimes black bears tracks will not show the claws, and that the small toe print also will not show, both factors making the black bear track look much the same as a cougar track.... so it seems clear now that this particular track must have been a black bear. Nevertheless, my research about Oregon's booming cougar population and its implications is presented on the pages that follow (please read on and make up your own mind about cougars). Below is an image sent to me, which I passed along to one of the experts who thought the above was a black bear track. This time, the expert believed the track below to be a cougar track. The picture was taken last year (2009) in the Fort Rock Valley, south of Newberry Crater and north of Silver Lake; the track was on a dirt primitive road, and one can see tire tracks as well as the animal track and a boot from a human adult male. Of course, numbers alone do not reveal the key danger ingredient, which is that Oregon cougars have very likely lost most of their fear of Man (although appear to have not lost their innate caution)..... Why do we hear so much more about cougars in California? I suspect it is because California has a several times bigger population of people to catch sight of its cougars than Oregon does! And why are cougars more fearless now? ODFW statistics show this: when hunting with hounds was permitted, there were few hunters but they were extremely successful, eg. in 1983 only 85 hunters had a 64% success rate.. So in those years, if you were a cougar and got chased by man, it was often fatal. But in recent years Oregon's hunter success is down to lowly 1 to 2%. In 2004, only about 250 cougars were killed by hunters in the entire State of Oregon. and in 2013, 55,000 tags resulted in less than 300 kills for a .005 rate of success......From the cougar's point of view, human hunters are blind and slow, with poor ears. If sighted by a human, cougars nearly always escape. Click to skip to information about the Human-Cougar conflict in Oregon's Willamette Valley. The sobering mountain lion encounter which is recounted below occurred approx. 10-20 air miles SE of the tracks shown, and was three years earlier in time. Given the vast normal hunting ranges of cougars, the cougars in the account below might have been regular roamers of the Table Rock Wilderness, perhaps even mates with the big cat whose tracks are photographed above! "October, 1994. Near dawn, Dan Parrish was out deer hunting with his father when he was confronted by a cougar in Oregon west of Detroit Lake about 45 miles east of Salem, Oregon (west of Detroit Lake likely places this site within 15-20 air miles of Mt. Pechuck, where we photographed the Mountain Lion tracks in about 1997)--- Walking down a logging road, he (Dan) stopped on a knoll which allowed him to see left, forward, and right into a clear cut. He waited there until he heard some cracking and popping behind him, and he hoped a buck was approaching. Instead, to his horror, a cougar head appeared just 20 feet from him. He thought he should shoot, but found this female so beautiful, that he hesitated. Then he heard more cracking and popping sounds from the woods behind his adversary. A young male walked up to her side. Parrish knew his .264 Winchester Mag with bolt action would not easily get off two shots in the time 2 cats could make the 20 foot distance between them, so he fired a warning shot into the air. To his dismay, neither cat moved, so he picked up a rock and threw it at them. Luckily, the male took off into the woods. Dan continued tossing rocks at the lion, but he was so nervous he couldn't hit her. He took a photo as proof he had seen the lion he didn't want to shoot. He calmed himself down, and finally hit her with a rock. This angered the lion, and she lunged at him. On her second bound, Parrish was able to shoot her in the chest. When she lifted her head, he shot her again in the neck and then fled to get his father. The two returned to examine the cat and then reported this to the Detroit Ranger Station. Officer Allison later told him that he had killed a 2-1/2 year old female weighing 85 pounds. Parish estimates she was over 6 feet long from nose to tail. Her paws were as big as the palm of his hand, and "her teeth were plenty long and sharp". Source: (Usenet groups archives <http://yarchive.net/gun/cougar.html>, collected by Norman Yarvin; posted by Dan Parrish, University of Portland, 02/02/95) " This cougar is now stuffed and ON DISPLAY at the Detroit, Oregon US Forest Service Ranger Station, and is well worth going to witness! Ranger station phone is 503-503-854-3366. My Commentary: some who study this problem say that most attacks are caused by human errors, citing several: humans entering the cat's "territory;" humans somehow making a mother cat feel that her young are in danger; humans in some cases even deliberately approaching and/or harassing mountain lions. Except for the last factor, I can only say that average humans recreating outside of their city limits don't have any control over the first two factors. The humans are not wildlife biologists--- they are just ordinary folk out hiking, mountain biking, hunting, jogging etc.--- unfortunately, there's no reasonable way for such humans to stay away from the vast hunting territories of these cats, nor to know if young might be near. How Many Mountain Lion Attacks Are Actually Occurring? The 1970's saw 17 reported lion attacks in the US and Canada (Note: basically all US attacks occur West of the Mississippi River, although there are persistent reports of rare sightings both in the Midwest and even as far east as Virginia; note: all such reports of cougar activity east of the Mississippi are denied by official sources like State Fish and Game departments). The 1980s saw 20 attacks. The 1990s saw 37 attacks. Some authorities believe that lion attacks are under-reported by a factor of 2 to 5 times! (Even taking this into account, there are darn few actual attacks occuring compared to other common outdoor dangers). Finally, here is a worrisome thought--- As we know, mountain lions are master stalkers, so we can only imagine how many times per year mountain lions are lurking, "scoping out" human beings, and then deciding against it, moving on undetected. The current President of the Northwest Outdoor Writers Association, Mr. Gary Lewis, wrote about mountain lions in the Fall 2004 edition of "Cascades East" magazine: "...Few hunters have seen him (the mountain lion) but be certain, if you have ever walked the high ridges in the Fall or sat on a rimrock high above a river, a mountain lion has seen you...."
Lurking, following, or tracking human beings: Here is a very recent probable example of this last type of event, and it will serve to pull our attention back to the Table Rock area--- it was Mother's Day 2004, and wife, myself, and our youngest son (age seven) were hiking near Table Rock... Halfway up, we met a husband and wife hiking back down. They were both large people who are very familar with this Wilderness. They had hiked all the way to the summit. Their report to us was that they had seen new-looking tracks in the snow which they felt sure were mountain lion tracks, which they reported were paralleling their own tracks. Further, they reported seeing much larger tracks when they had been hiking in the same area last summer.... Indeed, it seems likely that the area in and around the Table Rock Wilderness is probably one of Oregon's mountain lion hotspots!. See page bottom* for yet another recent lion encounter in this area.... Read more about the Human-Cougar conflict in Oregon's Willamette Valley. How Much Real Danger to YOU? There are many cougar complaints reported to authorities in Oregon each year... In 1999 there were 943 complaints, and in 2000 there were 645 complaints, versus only 151 in 1992 (source: news story by Jessica Bujol, Associated Press Writer, reporting ODFW statistics) In 1999, the latest year reported by ODFW, 128 cougars were killed during the course of resolving the complaints, which averages out to about one every three days! Yet, for all the complaints, up 'til probably 2007, there seems to have been not a single actual attack of a human in Oregon that resulted in injury! ....Update: 2004 official Stats listed 853 cougar complaints. Update, 2009- it has been alleged to me that a middle-aged man about age 59 was attacked and later died. His name was Danny Smith of Coos Bay/North Bend, attacked by a cougar in the hills east of Coos Bay in Spring 2007; reportedly, he was severely injured and died of complications several weeks later, in July 2007 (perhaps the Cause of Death was not listed as a cougar attack?)... I have not attempted to verify this report, but if others investigate, please let me know (brucej@oregonphotos.com). Cougar Facts from my son's colorful "Wildlife Fact File" (0160200131, Packet 13).... Cougars weigh 80 to 230 pounds. They are carnivores who prefer deer, but will eat basically any larger or smaller animal they can catch and kill. Their powerful legs propel them like cannon balls at their prey--- "a mountain lion pounces so violently that it can drag its prey 20 feet along the ground." My son's material goes on to state that mountain lions can "easily cover 23 feet in a single bound," from a dead stop on the level, and much longer leaps have been reported. They can leap from lofty trees or ledges at their prey, sustaining no damage in falls over sixty feet high! They can leap upward into trees, landing on ledges or branches 18 feet in the air! All their senses are keen. They have sharp color-vision eyes possessing near see-in-the-dark capabilities, excellent hearing and great senses of smell. And if you think you can escape one by jumping into a lake or river, think again, they're not afraid of water! It's no wonder that few animals can evade them and fewer still can successfully fend them off if they choose to attack. Read the accounts of cougar attacks, and you will note that even small cougars of 60-80 pounds are easily capable of killing adult human beings, even large athletic mountain bikers, game trackers, forest rangers, etc..... According to an expert hunter that I spoke with, who has hunted for many years with dogs, the only weakness of cougars is that they are not capable of long-distance endurance running; eg. they can sprint extremely fast, but if a person on a bicycle, for example, could get enough of a head start, especially with some downward gradient to help, they might be able to outdistance the cougar. The Bureau of Land Management administers the 6,028 acres of the Table Rock Wilderness..... Here is a link to their webpage about the Wilderness. The discerning reader will note that their section about the wildlife of the wilderness does talk proudly about the area's populations of black bear, Roosevelt elk, coyotes, bobcats and blacktail deer, but says not a single word about the existence of mountain lions! Recent Developments re: Oregon's Cougars 2005-- Important Changes! * MEHAMA, OREGON (CENTRAL CASCADES), November 8, 2000.... A similar incident to the Dan Parrish encounter occurred six years later near Mehama, Oregon, which is only 20 miles east of Salem. In this encounter, a hunter rounded a bush and surprised a mountain lion coming the other direction around the bush. At first the startled lion jumped away but then stopped and looked back. The hunter felt menaced and shot the lion, but it is less clear that this lion behaved aggressively. Source: (Interview with Oregon Department of Fish and Wildlife biologist, Will High 01/19/2001) This fatal encounter (for the lion) occurred 20 air miles SW of the tracks on Mt. Pechuck, again close enough that the lion may have been related to the animal leaving the tracks on Pechuck. "...Port Alice (Canada) residents have long been aware of the dangers of cougars and have been warned by officials to walk in groups or carry bats, knives, or pepper spray to protect themselves from aggressive cats. Thursday's attack was the fourth in about two years." Immediately, I envisioned the cougar ripping my belly open with its front claws. With my right hand, I pulled the cougar's head, neck and shoulder over my chest, rendering the front claws useless as I pinned the cougar's claws to my chest. I then instantly threw my left arm around the cougar's neck and shoulder...."
And this from Big Bend National Park, Texas in 2003. That year there was a cougar attack on a lone adult male hiker, "....When trails reopened new restrictions were in effect: No hiking alone and no children under 12 allowed. Some remote campsites remained closed until further notice." OLYMPIA, WASHINGTON, 2008 and 2002 (Olympia is at southern tip of Puget Sound, and the capital city of Washington State).....Finally, from Olympia, Washington, two incidents, one in 2002, and one in 2008--- September 11, 2002. It's another jogger-type attack. 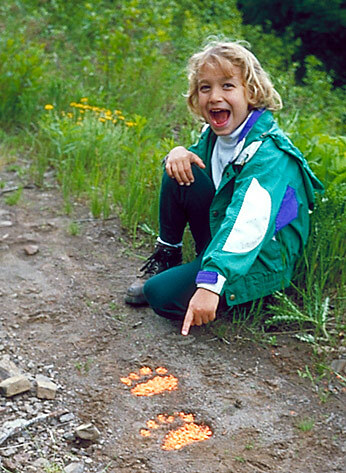 The alarming irony with this account is that it points out continuing danger to the boy pointing at the cougar tracks in the picture at page top above! The young man in the picture now lives in the State of Washington's capital city, Olympia..... He could easily be out walking with his Mom and their dog on this very trail mentioned in this attack: " 31-year-old Gwyn Stacey, was attacked by a cougar as she jogged with her dog between 6 and 7 p.m. near Summit Lake, just west of Olympia, Washington. She ran into the cougar, which she estimated to weigh 80 or 90 pounds, at the top of the peak on her routine run. It was on top of a rock outcropping. It disappeared after a short time during which she yelled and waved her arms. After backing away for a short distance, she began running back out, and it stalked her along the way, eventually running ahead of her and waiting for her. She saw it in some bushes just before it attacked her, giving her a chance to dodge it, so that the lion only scratched her arm with a single claw and leaped over her and ran off. It made only one pass at her, and it showed no interest in her medium sized dog at any time during the stalking. ".....the 2008 cougar encounter in Olympia occurred on July 20, 2008. I happened to see a TV news report where the young teenage boy was re-enacting how he had climbed a tree to escape a cougar. This was not miles out in the wilderness, but right in an Olympia city park. Olympia/Lacey/Tumwater is a metro area of about 80,000 people that is heavily-forested. The name of the park was Grass Lake Park. The boy was treed for about 20 minutes while the cougar circled the base of the tree-- 911 had been called and when Police arrived the cougar ran off and escaped. So the animal is still at large somewhere in this well-populated area, with ample thick cover for continued evasion of the authorities. In Oregon, this cougar would have met the definition of "menacing" a human, and would likely have been hunted with dogs and killed. I do not know what follow-up action Washington State will do. Anyone with further information about this incident is welcome to contact me. More about the 2002 Olympia incident--- "State Fish and Wildlife officials had been warning area residents to be careful regarding mountain lions in the area. A report was made only when the woman happened to mention the attack to a forest ranger the next day while picking up maps at a national forest headquarters. Wildlife officers used hounds to track the cougar. As of the following weekend, they had been unable to pick up a scent, but they planned to keep trying. Sources: (The Olympian; Olympia Washington; Cougar that hurt woman still on lam; Olympian staff; 09/15/2002) (E-mailed interview by author, Jerry Stoddard; 09/18/2002)"
For many years, it was supposedly true that cougars had been permanently exterminated from huge areas of the US. This belief was especially true for the non-mountainous flatlands of the Midwest. There were some reports of a remanent population in the Black Hills of South Dakota (the "Hills" are really a pretty big group of mountains with plenty of potential habitat for cougars).....But then in recent years there have been various much-debated sightings of cougars all over the Midwest and down into parts of the South, even so-called "black cougars." 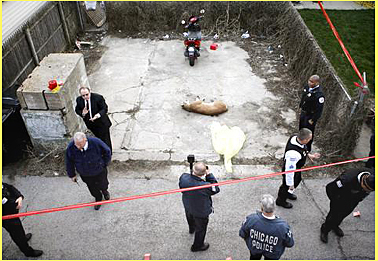 Finally, on April 14-15, 2008, a 150 pound cougar was cornered and shot by Chicago police in a heavily populated area on the north side of Chicago along Lake Michigan. It was a normal, tan-colored cougar. ..The cat had been extensively seen all day and at one point had charged at the officers. . It was suspected that this was the same cat that had been much-sighted two days before in another part of north Chicago even closer to city center...The story was covered by several local TV stations, complete with footage of the cougar at one point sneaking right behind one of the many officers trying to find it! Do a Google search and you will find several of the news reports available. End of Cougar page one (one of four pages).